This Adorable Pup Is Having The Time Of His Life Playing At The Beach! In some places, however, the waters are much gentler. Having lost energy from encountering something much bigger in their way, all the waves can do by the time they reach shore is wash up along the beach gently. Which, as it turns out, works in this Labrador and Australian Shepherd pup’s favor! 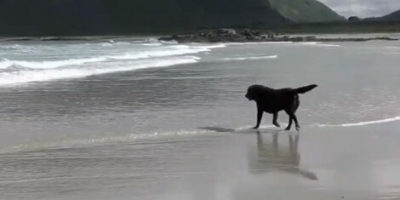 Now, this pup can trot up and down the beach in relative safety, since these waves aren’t too big. And it looks like it is an experience that is plenty of fun for him too!